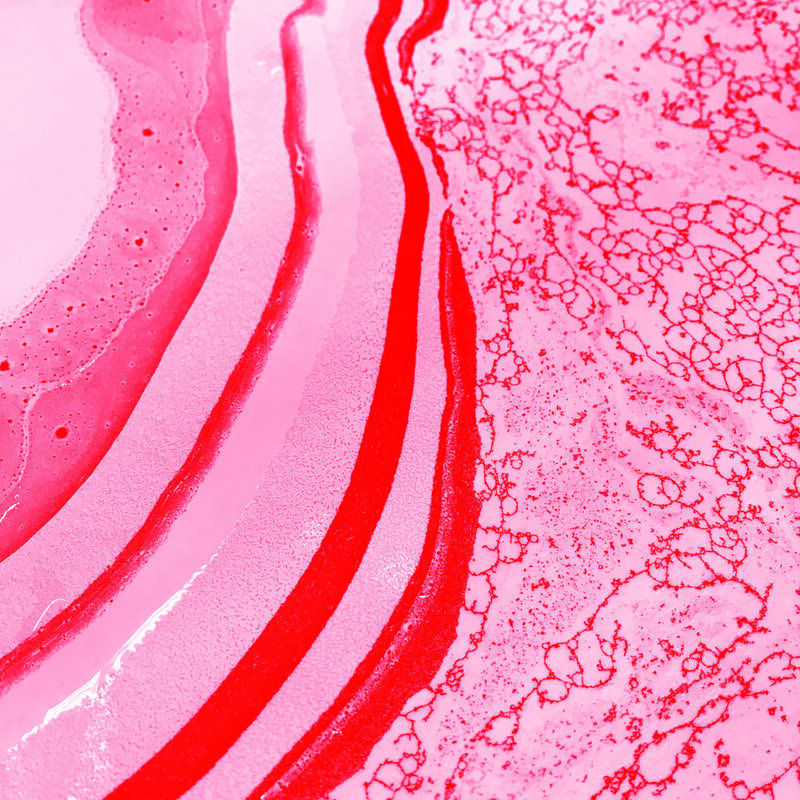 This workshop considers environmentally conscious processes for dying silk. Plant extracts, bark powders and fresh flowers and herbs are used with a steaming process in place of chemical dyes and methods. We used a bundle fold process to create repeat patterns over a longer run of fabric. I was interested in this process because of the implications that dying has on the environment, being on of the largest causes of environmental water pollutant. The workshop examined the use of natural dyes through plants as well as the healing properties that could potentially be imbued within the fabric. Herbalism has been recorded and transcribed throughout history with significant pharmacopoeia and compendium being The Canon of Medicine, 1025 by Avicenna, Materia Medica, 1334 by Discorides andNicholas Culpeper's The English Physician Enlarged 1653. A significant amount of knowledge around herbalism was lost during the horrific witch trials of early modern Europe when the research and investigation that these women had carried out was also destroyed. We were asked to consider the healing property of plants as well as psychological and personal narrative significance that plants might possess. The selection of plants that I used (roses, cornflower, dill, oakwood powder) were ones that I was initially attracted to but also reminded me of my childhood and narratives around journeys - from the flower beds of my parents garden through to the fleeting images of fields and the English countryside on our way to holidays and day trips. I chose the folded method because I wanted the cloth to mirror the repetitive nature of these journeys - not in a monotonous way but reflecting the beauty of expectation and familiarity. The natural fading of the patterns reflects the failing memory, which is then refilled when the journey is taken again. Stronger memories are prominent stains; single memories that last. These are surrounded by feint marks; distant ghost memories. 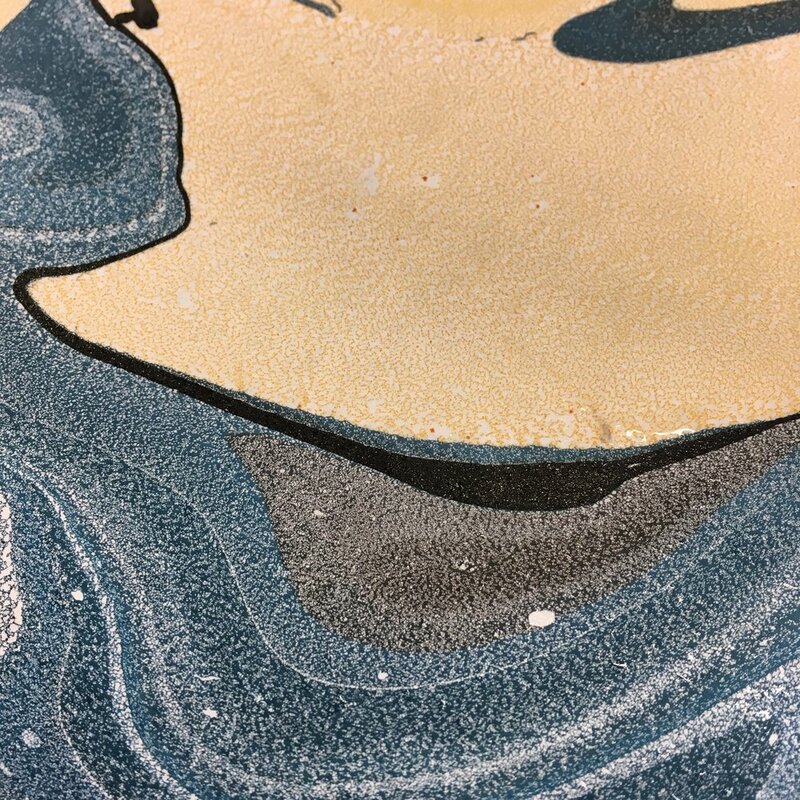 After the workshop, I began to consider how this could connect to my project and how the process could work with lichen which are recurring images and themes throughout my book. 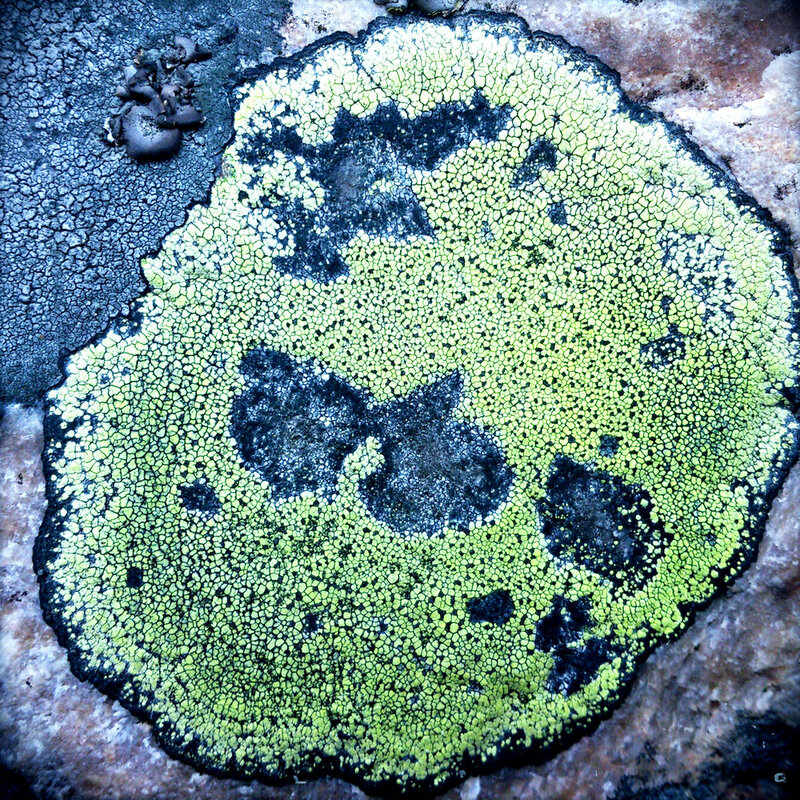 Further research suggests that the extract of lichen would produce intense colour. I'd like to experiment with the process to see if the saturation of colour from the lichen would alter, be less vivid if the lichen has been affected by pollution. I plan to bundle die collected windfall lichen as well as trying to distil some pure pigment form the lichen itself through a cold extraction process, to then use for screen-printing. The process of the workshop run by Botanical inks (www.botanicalinks.com) is outlined in pictures below from the spreading of the plants and flowers to the bundling and steaming process. The silk is currently curing after which it will be set through ironing and washed in a PH neutral soap. I set my students a summer project, which was to choose a subject and through repetitive observation, draw and study, observe and investigate that subject, object or idea. 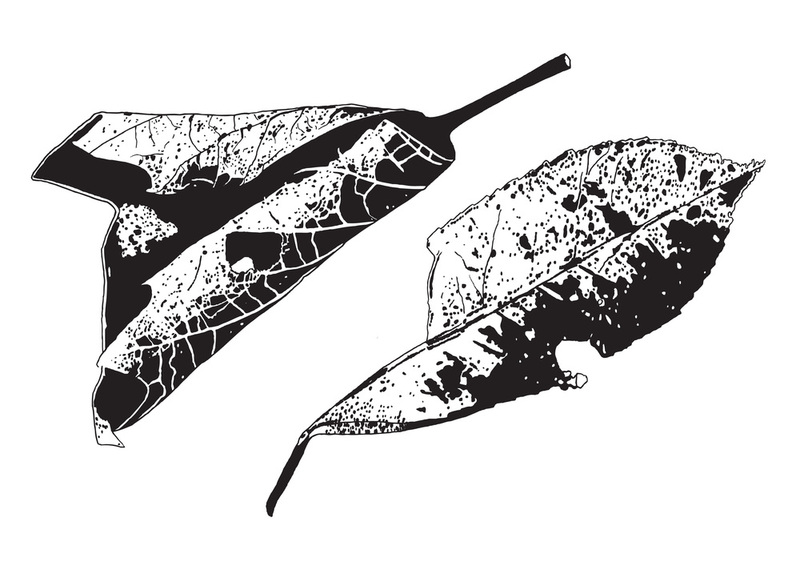 I decided to work on series of drawings that explore the structure of leaves. I chose fallen leaves as my subject as it is linked to my graphic novel research and exploration of narrative themes around climate change and the Anthropocene. Visually, I wanted to explore the physical space and shape of the leaves that I collected through marks. The leaf form is protected when it is on the tree, it is fed and held, awake and when asleep. When the leaf falls, the form is altered through lack of moisture, exposure to different textures and surfaces and damage through movement and interaction with other microbes, insects and bacteria. We regularly see fallen leaves them as a mass. Through studying the leaves closely, I have become aware of the similarities and individuality of different leaves. The process of drawing similar forms has also forced me to extend and expand my visual language for recording these. This sometimes involved more fluid rapid marks and sometimes, determining the elements of the leaves as a more geometric structure. The obsessive drawing and time taken to complete the leaves has hopefully captured the fragility and beauty of something that is transient, fluid and taken for granted. The project is also a record of my walks from my home to work, collecting these leaves and taking them home to commemorate them through drawing and archive their existence. The Fourteenth Illustration Forum from the MA Illustration team at Falmouth University is on 18th March 2016. The theme of this forum is BLUE and alongside the symposium, an exhibition of selected works will reflect considerations of this theme. The earth is composed of blue (sky and water), green (vegetation) and brown (soil) and we naturally and often without thought visualise and assume this. The composition of Earth is balanced and harmonious when these three colours are pure and abundant. However, this fragile aura is disrupted when other colours infiltrate and disturb it, such as fire, smoke, industry and development, human interaction and pollution. These ideas form the overtone for the narratives within Entangling. Entangling uses colour to encode the narrative and present a subtle visualisation of the disturbance of the earth’s balance. The BLUE sections in Entangling consider our relationship and awareness of water. The following images from Entangling have been selected for the exhibition. Sky can be all different colours. It can be red, brown and all the colours of the rainbow. You can not feel the sky because it is air and oxygen.